I purchased this suit for my grandson I was very pleased with the this suit. Our selection of girls clothing includes both classic and trendy fashion so you can dress your little girl appropriately for a day at the park, her first day of school, church or a special occasion, such as a wedding or pageant. Sophia's Style carries a variety of sizes: newborn baby girl clothes, infant girl clothes, toddler girl clothes, 4-6X girls clothes, 7-16 girls clothing, as well as plus sizes. We feature many designer brands for our girls clothing such as Us Angels, Rare Editions, Bonnie Jean, Kate Mack and Biscotti. For customer service inquiries or to initiate a return, please contact Sophias Style Boutique at help@sophiasstyle.com or (402) 991-6398. 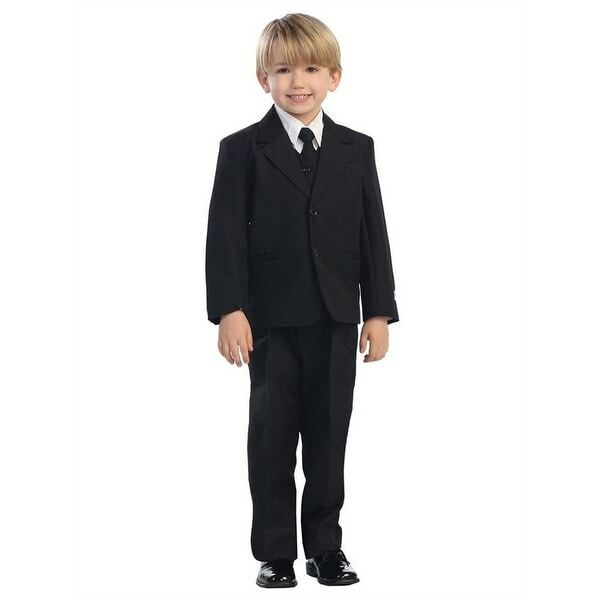 For a dress code that is formal and classic and a dapper look this suit from Tip Top Kids makes a great pick. Well-fitted suit, great for any boy's wardrobe. Single breasted solid color suit set is made of 5 pieces: Jacket, Vest, Shirt, Tie and Pants. It comes in black color for a look that is both versatile and distinctive. Suitable for little boys. 5 star quality. Fits perfect. Was the sharpest suit in the entrie wedding. Will do again without a doubt. Several folks asked where did we buy the suits. .